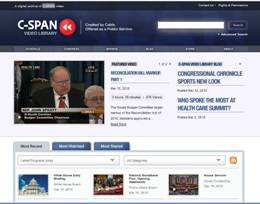 C-Span has made its entire video archive available for free here. It offers over 20 years of political history, and is searchable by keyword and browseable by program. It includes tabs for most recent, most watched, and most shared videos. It also features Supreme Court oral arguments, including Citizens United. A search for Pace University Law School retrieves videos with President Stephen Friedman, Professor Robert F. Kennedy, Jr., and Professor Nicholas Robinson.